Editors note: An earlier version of this story, which also appeared on Page 1 of the Nov. 25 print edition, misidentified one of the automakers involved in a fuel cell development partnership with Nissan and Ford. Daimler works with those companies on fuel cell technology. LOS ANGELES -- A battle is brewing in, of all segments, hydrogen fuel cell electric vehicles. As Honda and Toyota announced plans last week to move their fuel cell EV projects from the drawing board to the road, Hyundai elbowed past them with a hydrogen-powered version of its Tucson compact crossover and a free-fuel, $499-a-month lease deal to go with it, all due out in the spring. That head start -- Toyota's fuel cell car is due in late 2014 and Honda's in 2015 -- positions Hyundai to put down stakes in the nascent fuel cell market by attracting the finite pool of early adopters, just as Toyota did with gasoline-electric hybrids. 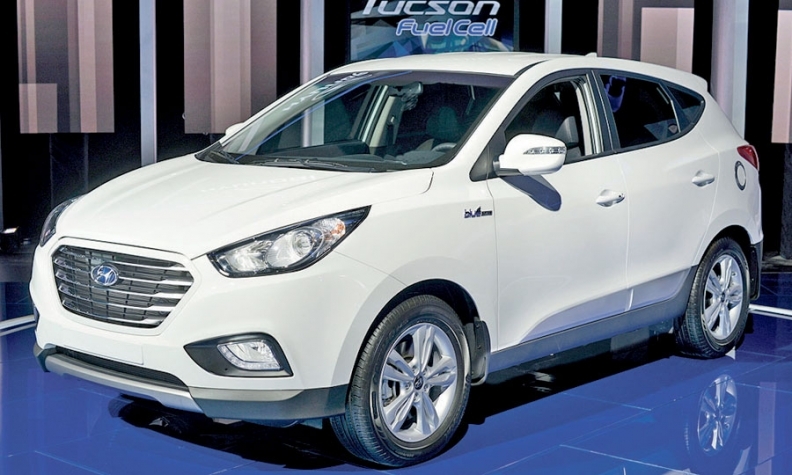 "Today, right here, the hydrogen fuel cell is making a shift from a research project to a real consumer choice," John Krafcik, CEO of Hyundai Motor America, said at the unveiling of the fuel cell Tucson at the Los Angeles Auto Show. For now, the battleground will be limited to Southern California, the only place capable of supporting hydrogen cars with its skeletal infrastructure of about 10 hydrogen filling stations. Executives from Honda, Toyota and Hyundai all concede that sales will be low and that refueling infrastructure remains a major hurdle. Yet despite the narrow expectations, the jockeying among Hyundai, Honda and Toyota marks a turning point in the larger contest over the future EV market, whose scope is broadening as California's zero-emission vehicle mandate drives automakers to put more clean cars on the road. Meanwhile, efforts are under way to address the shortage of filling stations. Nineteen new hydrogen fueling stations are under development in California, and the state plans to fund and open 100 publicly available stations by 2024. For years, the viable hydrogen-powered car was a long-range dream project at various automakers, often working in partnerships to share research costs. Boosters say it solves the two biggest problems facing battery EVs -- limited driving range and long recharging times -- and produces only water vapor as waste. But massive unit costs and a lack of fueling infrastructure dimmed its commercial prospects. "It's the technology of the future, and always will be," an old joke goes. Battery EVs, meanwhile, have moved much faster to market, despite their limitations, thanks to generous government subsidies, improved performance, declining production costs and the option of home charging. Several automakers, including Nissan and BMW, have made big bets on battery EVs as their zero-emission vehicle of choice. And Tesla Motors has shown that battery EVs can have real-world range well beyond 200 miles on a charge, eliminating the perception of them as merely city commuter cars. Now, the hydrogen camp is poking its head out of the laboratory basement. Producers say newer prototypes have brought big reductions in the cost and size of a fuel cell powertrain, enabling it to fit into the traditional engine compartment. The fuel cell vehicles shown here and in Tokyo last week all touted a driving range of about 300 miles, beating even the most capable battery EVs. Fuel cell vehicles use electric motors that use energy generated on board from hydrogen stored in tanks. Honda gave an early look at its next-generation fuel cell with a concept car at the Los Angeles Auto Show last week that's expected to debut in production form in 2015. In Tokyo, Toyota unveiled what it described as a "practical" fuel cell car slated for production by late 2014 or early 2015. In an interview, American Honda CEO Tetsuo Iwamura said the fact that from a consumer's perspective, fuel cell EVs operate much like gasoline-powered cars -- without the emissions -- outweighs the near-term infrastructure challenges. "The starting [sales] number is not important at all," he said. "The question is how can we get acceptance of fuel cell technology by industry, filling stations, oil industry and customers." Jim Lentz, Toyota's CEO of North America, likens the company's push into fuel cell vehicles to the development of the first Prius, a car that at the time, with gasoline just more than $1 a gallon, had little business case. "It was a science experiment, and we were letting our engineers stretch their legs," Lentz said of the original Prius. The thinking, says Lentz, was that "at some time, there is going to have to be an alternative fuel besides gasoline, so why not get ahead of that and do your groundwork today?" Bob Carter, Toyota's U.S. sales boss, echoed that comparison, recalling his presentation at the 1999 New York auto show where the Prius was introduced. "The initial forecast at the New York show was 25,000 units. I had my game face on, but inside I was thinking, 'Where am I going to find 25,000 customers?'" The issue of finding customers is the same for fuel cells. The scant refueling infrastructure won't help. But Carter says "we have to look past" those limitations to "what hydrogen has the possibility to represent. It removes the two biggest objections people have with EVs -- range and recharge time. Infrastructure will take time to develop. And it will take education to get more of the mass market to look at it. Our eyes are wide open. We have modest expectations, but it's got to start somewhere." Rival auto executives see a bit of wide-eyed folly in the renewed push for fuel cells. Such low-volume fuel cell programs are "frankly, not relevant" in the quest for a meaningful alternative to fossil fuels, Nissan-Renault CEO Carlos Ghosn said last week in Tokyo. Nissan is involved in fuel cell development through a partnership with Ford and Daimler, but in the absence of a refueling infrastructure, Ghosn dismisses their commercial prospects. Meanwhile, Nissan is preparing to boost production of its Leaf EV in the United States. "I don't hear one car manufacturer saying they're going to engage in mass marketing of fuel cell," Ghosn said. "And, frankly, I don't know how they're going to do it." Likewise, General Motors, which has bet heavily on plug-in hybrids, isn't convinced that the iron is hot enough for hydrogen. GM has spent billions on fuel cell development, and a demo fleet of about 120 fuel cell-based Chevrolet Equinox crossovers has racked up around 3 million miles of real-world use since 2007. But in the near term, GM is focused on supporting infrastructure development through an alliance with Honda, GM North America President Mark Reuss said. "The next phase of this is sort of 'How do we really change the way people think about the refueling of hydrogen?'" Reuss said. "That's what really hasn't been solved for us." BMW AG ditched its hydrogen project in 2009 after putting 50 hydrogen-powered 760Li cars on U.S. roads in 2007 as part of a test fleet. Ian Robertson, BMW board member for sales, said the brand will rely on battery electric and hybrid vehicles to meet tough new emissions standards. "Hydrogen is further out, probably at least a decade," Robertson said. That opens the field for bullish companies such as Toyota, Honda and Hyundai. Not only will Hyundai's Tucson fuel cell beat new hydrogen vehicles coming from Honda and Toyota by several months, it will also come with a sweetheart lease deal: $2,999 down, $499 a month for 36 months -- plus unlimited free hydrogen fuel. Hyundai hasn't abandoned battery EVs, Krafcik noted. He said the company sees room in its vehicle portfolio for both battery- and hydrogen-powered cars. But by calling fuel cells "the next generation of electric vehicles," Krafcik underscored the seriousness with which the industry now views the technology. "It's always important to be the leader," he said. "There are certain advantages that come to those who are first. We're always going to be first." Lindsay Chappell, Mike Colias, Diana T. Kurylko, Mark Rechtin and Richard Truett contributed to this report.